Two weeks ago I talked about using Couch to 5K to start running. I more-or-less finished the program and ran 5K during a workout. That speed plummet near the end there? That was when I was feeling pretty good, turned on “Fel Del Av Gården,” and really picked up the pace. That it registered as a significant drop in speed is disappointing to say the least. My guess is that when I sped up, my stride changed from the one I had calibrated the sensor with. I was moving faster, but my foot must have been in contact with the ground longer [pdf], so Nike+ thought I had slowed down. Since distance = speed × time, and I no longer trust the speed measurement, how far am I really going? Luckily, government satellites are here to answer the question. 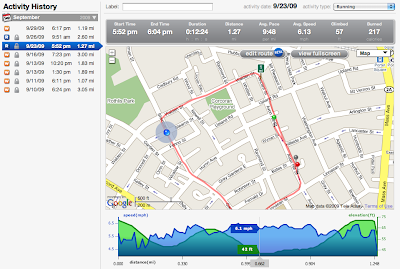 RunKeeper [iTunes] is a free app that uses the GPS capabilities of iPhone 3G and 3GS to track position during a workout. In this way it can measure speed and distance more accurately than Nike+ as well as plot the position data on a map. 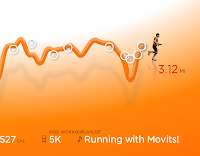 A graph that lets you mouse over to find your speed at any point during the workout. Nike+’s graph only shows numeric speed information at points where you had already pressed the home button. An automatically-created map of the route and elevation data along the graph. So shiny! Categorizing of activities (such as running and walking). I had to stop using Nike+ during my walks because it would affect my average speed calculation. A faster, cleaner interface. It still uses Flash for the graphs, but it’s overall less of a beast than Nike+. I’ve been running Nike+ and RunKeeper simultaneously and trying to re-calibrate Nike+ based on what the GPS readings have been. Unfortunately, my current pace seems to be on the cusp between two stride lengths, so if I calibrate for going a bit faster, normal speed gets inaccurate and vice-versa. I’m a bit reluctant to stop using Nike+ for runs, but that may have more to do with my investment in particular shoes and a gadgety sensor than any actual utility I get from the software. Since I don’t take advantage of the social features, there’s little to recommend it. What Nike+ does currently give me that I’m still taking advantage of is voice prompts for time and distance during the workout (or, at least what Nike+ thinks is the distance), but I could get that by upgrading to RunKeeper Pro [iTunes] for $10. WARNING: For usability reasons with iPhone typos, RunKeeper will send you your password in the clear via e-mail if you request it. Make sure that you choose a completely unique password when you sign up for RunKeeper. TIP: Take RunKeeper up on its suggestion to disable Wi-Fi during your workouts. This will keep iPhone from being tempted by SkyHook’s hotspot location data and instead rely solely on GPS. That’s the last of my planned Getting Smaller with iPhone posts. You can see them all at the diet label. I hope you’ve enjoyed them and found them useful. Have any other iPhone apps that will assist in getting smaller? Leave tips in the comments.